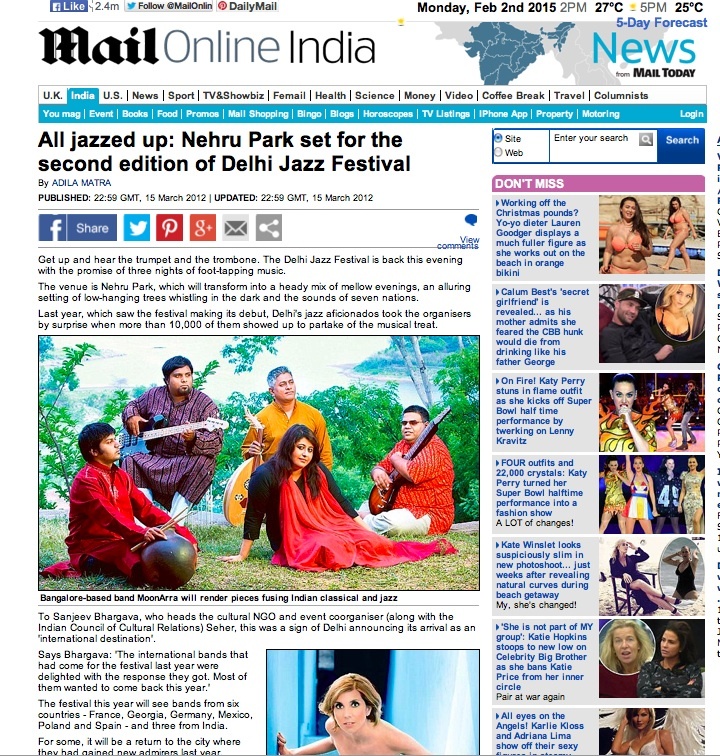 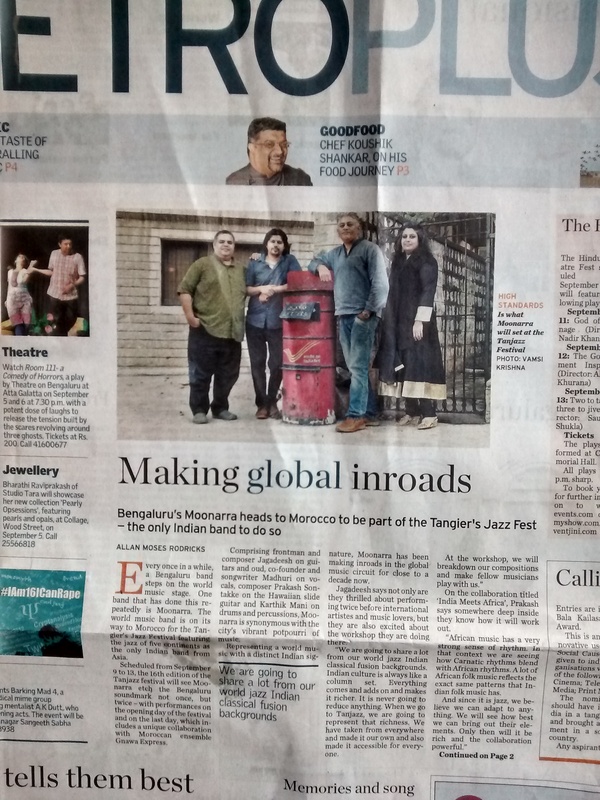 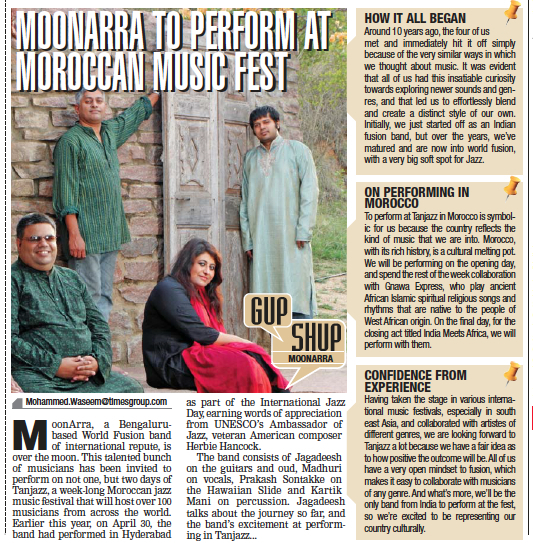 Press clips - Tanjazz Sep 2015 'Jazz of 5 Continents' Festival, Tangiers, Morocco. 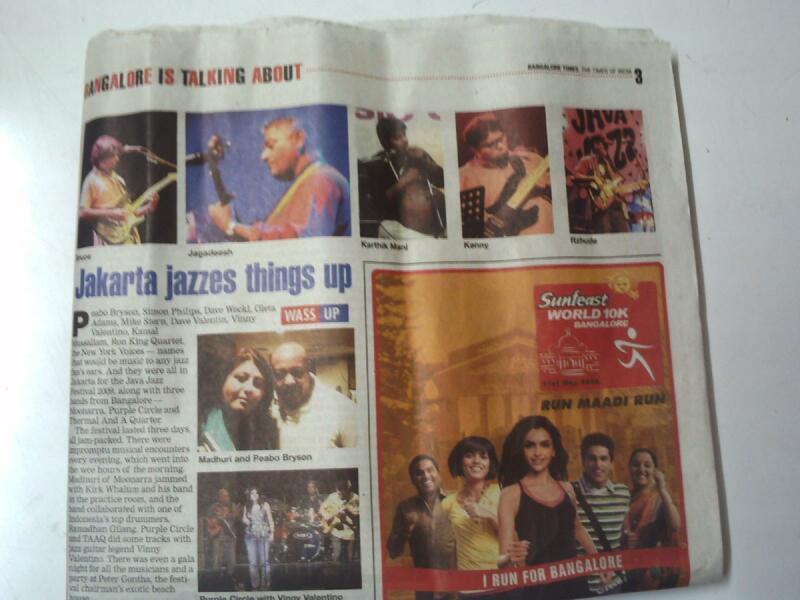 After Susheel Kurien’s film Finding Carlton: Uncovering the Story of Jazz in India was shown on October 15 in Bangalore (Metro Plus, October 25, 2012), a member of the audience had asked Kurien whether there was any chance of seeing and hearing Carlton Kitto, the Kolkata-based jazz guitarist whose story is one strand in the film, in Bangalore. 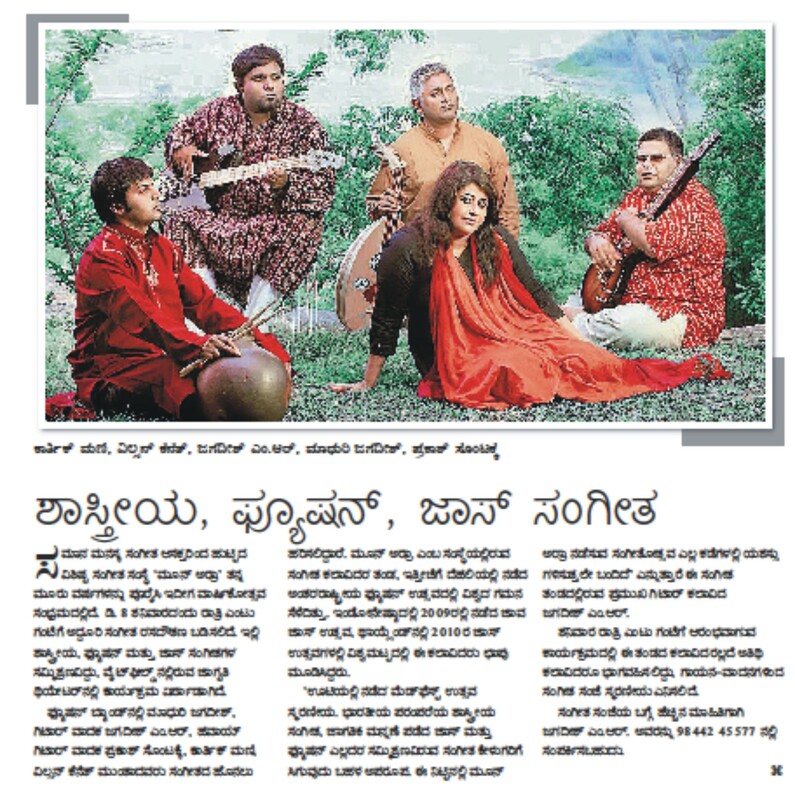 In fact, as Kurien informed us, the film was shown again on the next two days at two other venues, at one of which Kitto himself performed after the film. 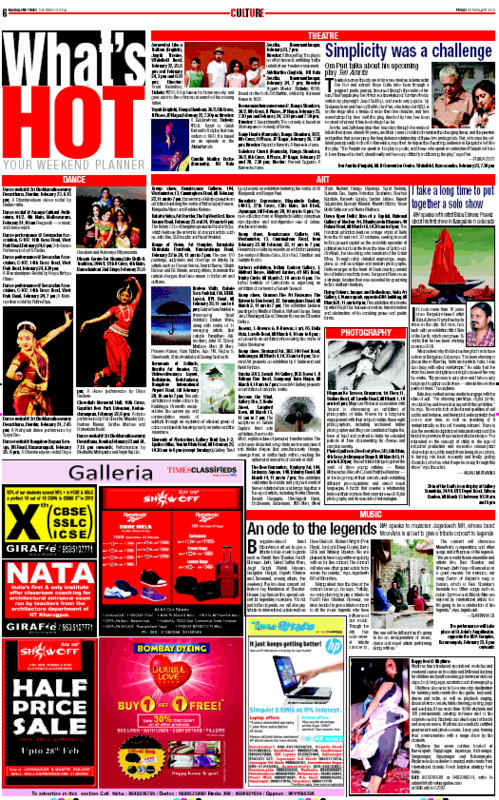 But Kurien had also told us that Kitto had had a serious accident and badly needed spinal surgery, which he couldn’t afford. 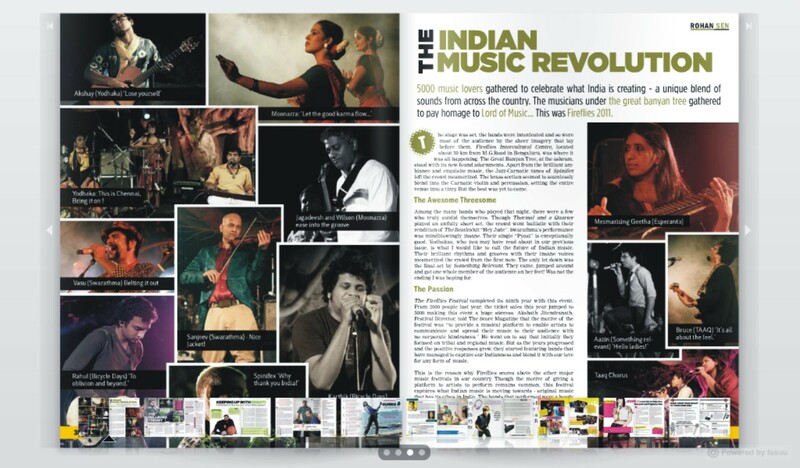 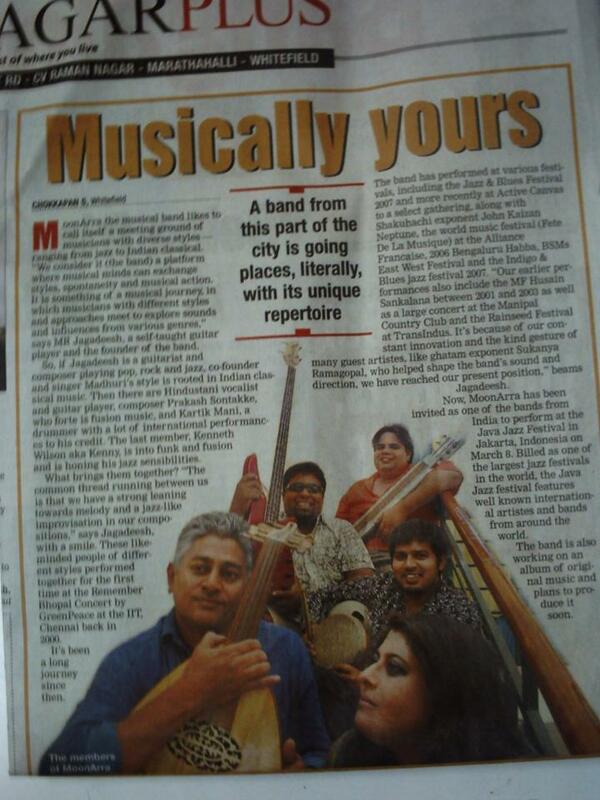 Enter the Bangalore School of Music (BSM) as personified by its Director, Aruna Sunderlal; M.R. 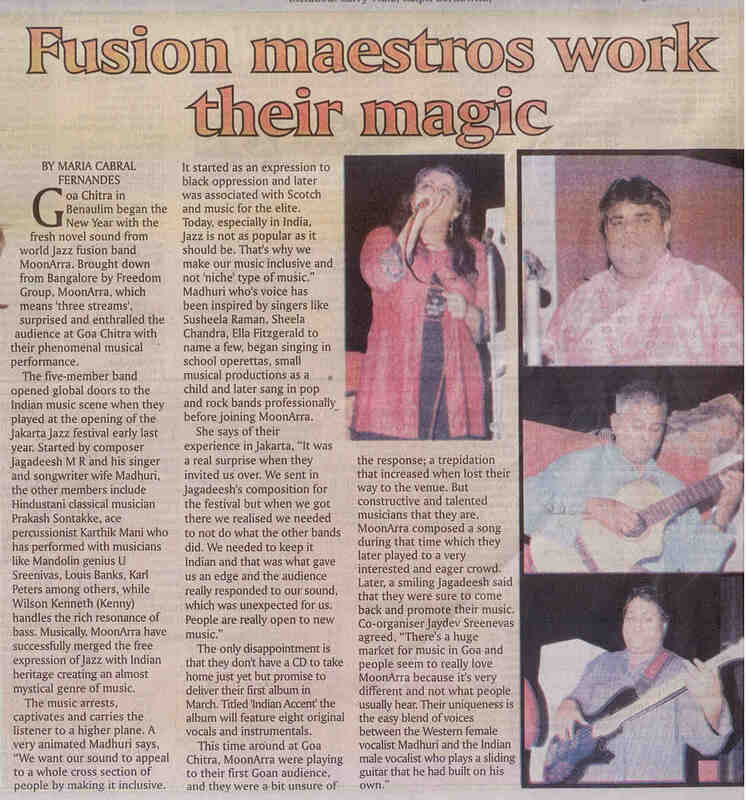 Jagadeesh, guitarist and jazz-fusion bandleader; and Carlton Braganza of Opus and his Gina Forever Foundation. 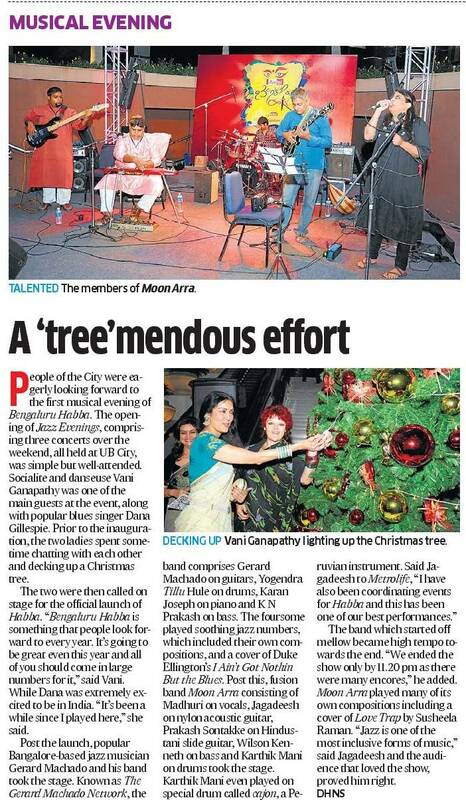 After those later screenings of Kurien’s films, they decided to take up the cause of Kitto and see if something couldn’t be done for him. 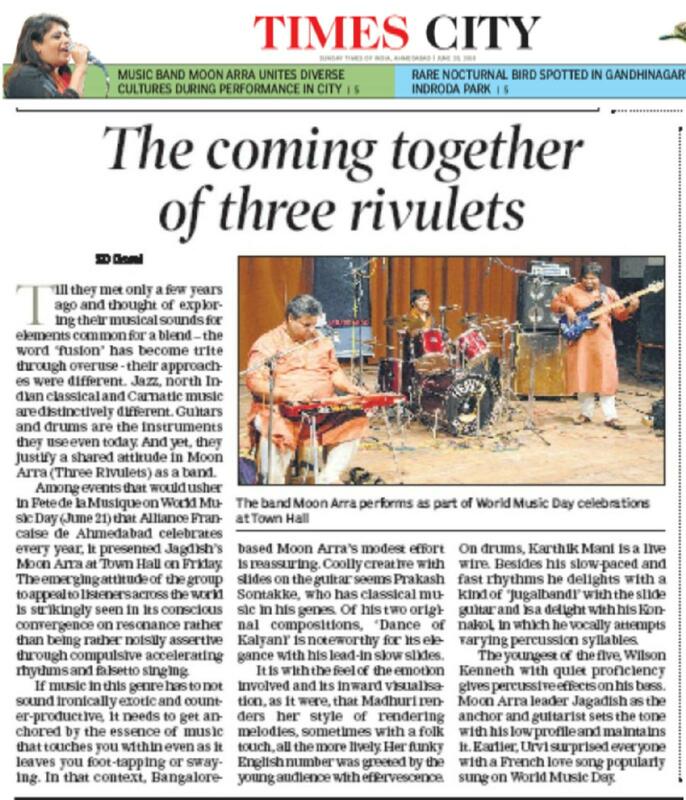 "Quintet eclectia...the coming together of three rivulets." 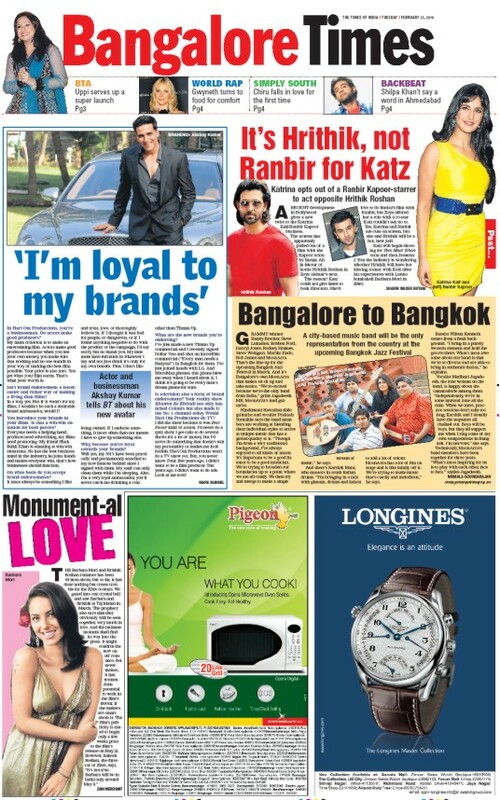 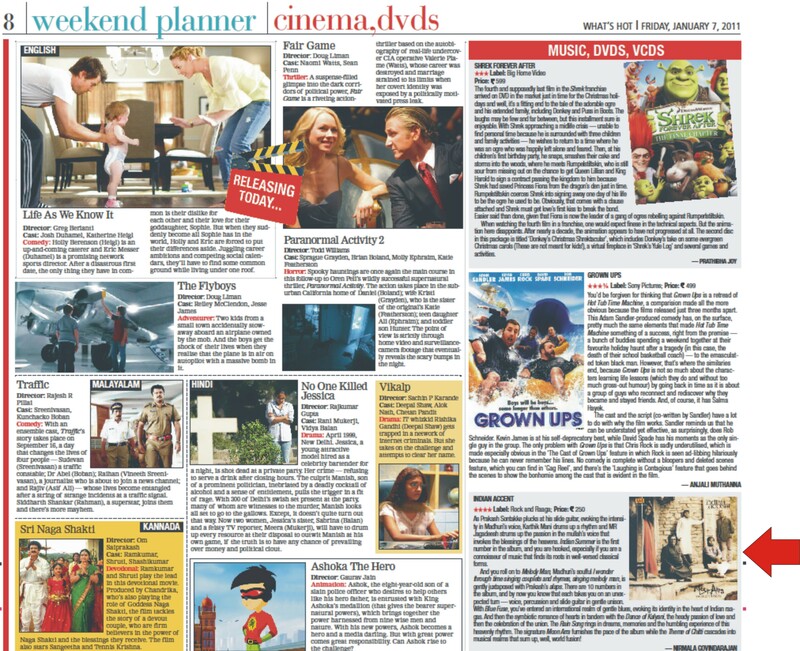 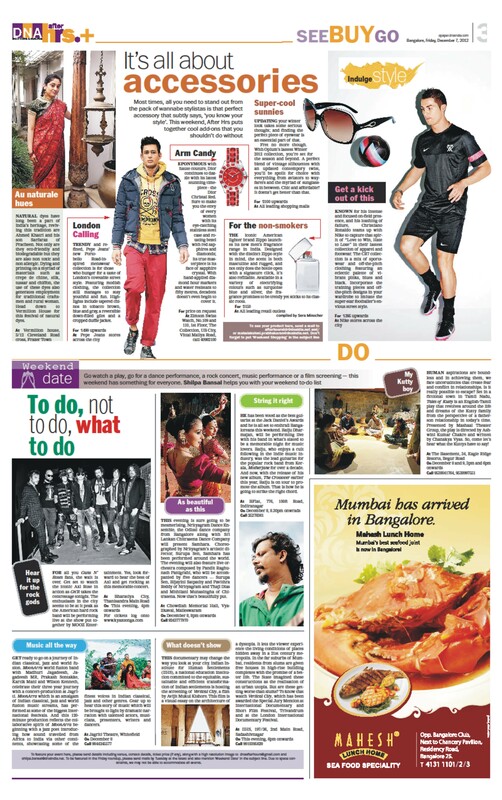 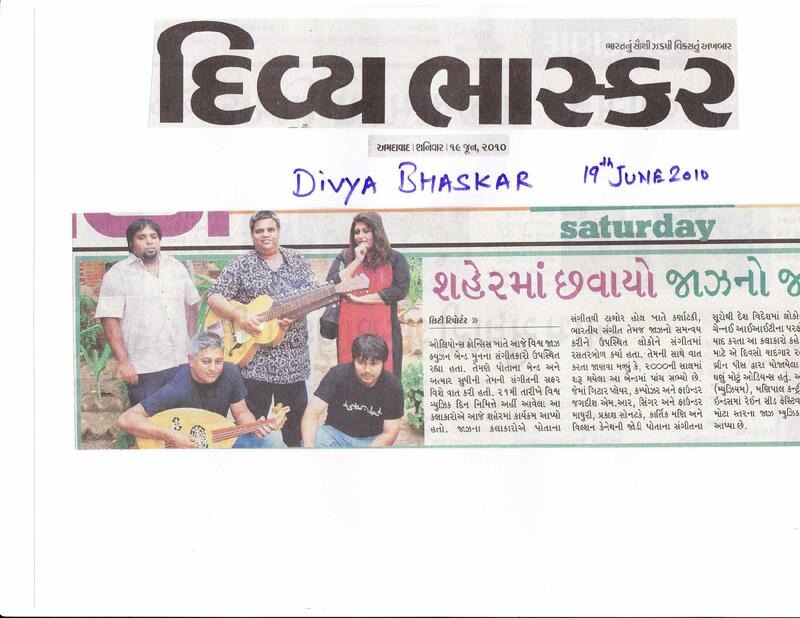 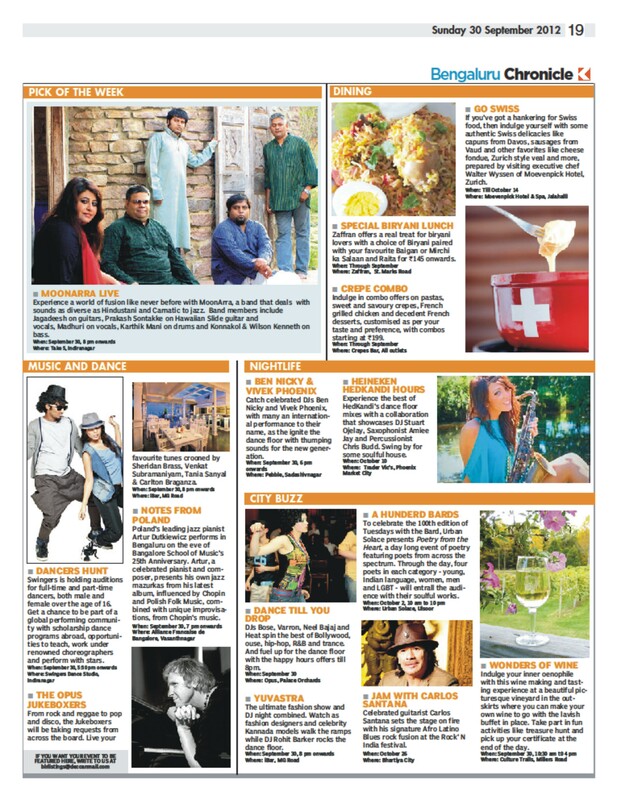 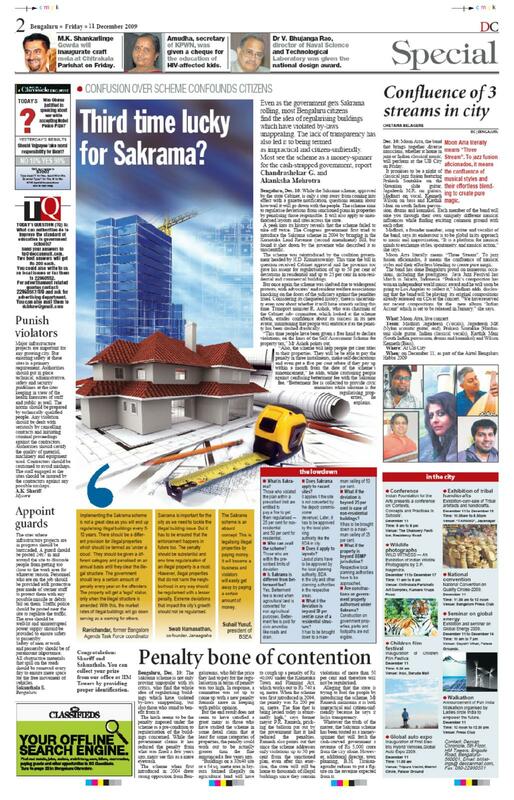 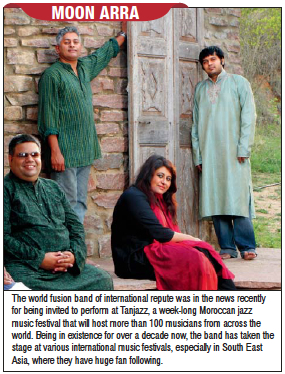 - The Times of India, Ahmedabad, June 22, 2010. 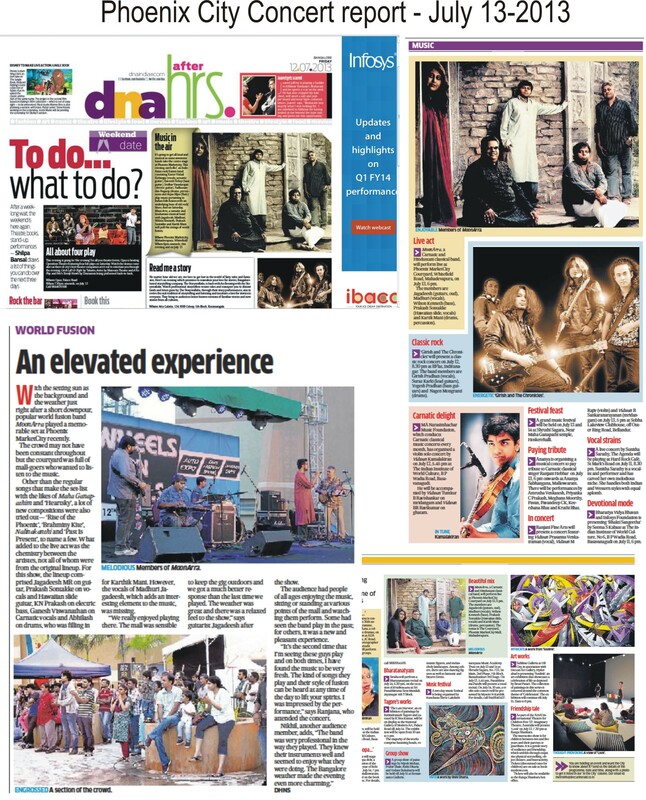 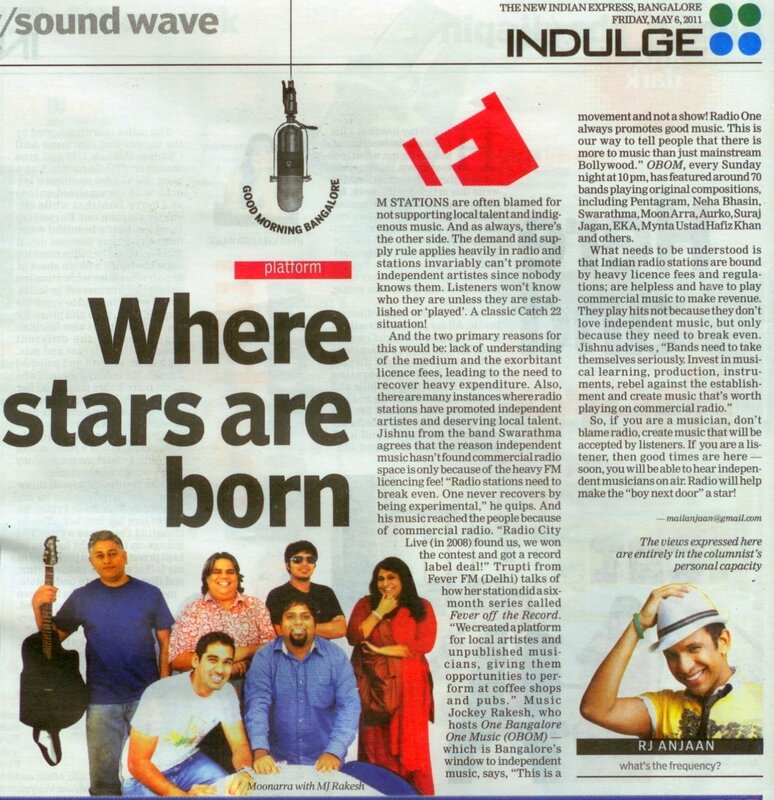 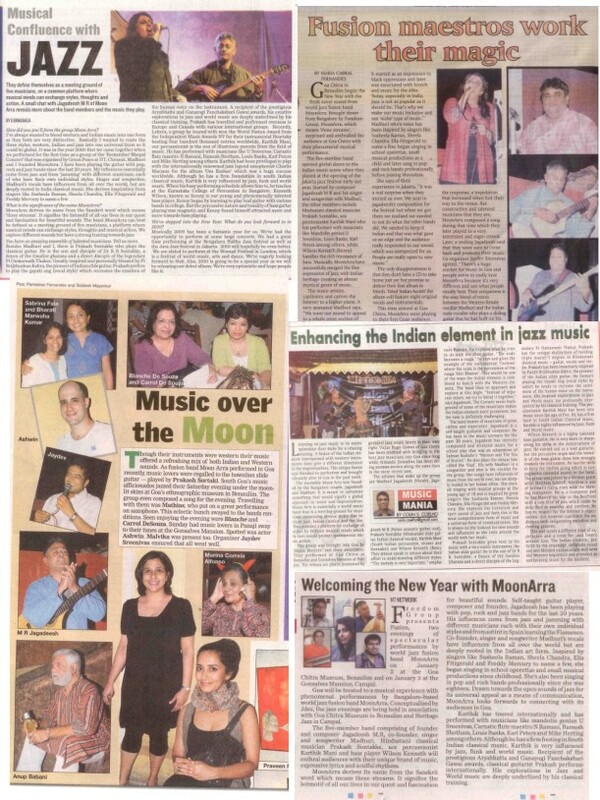 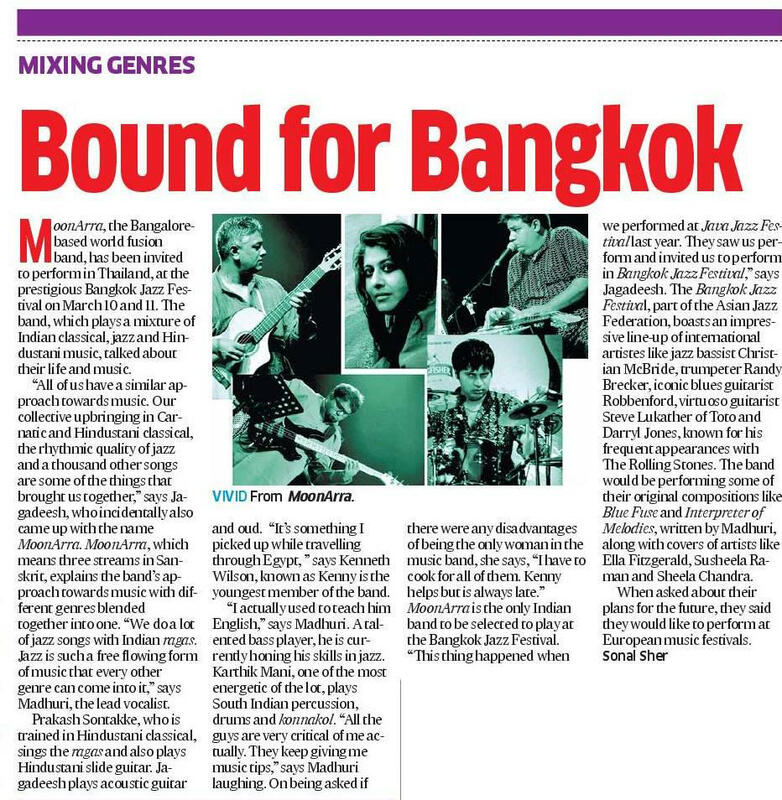 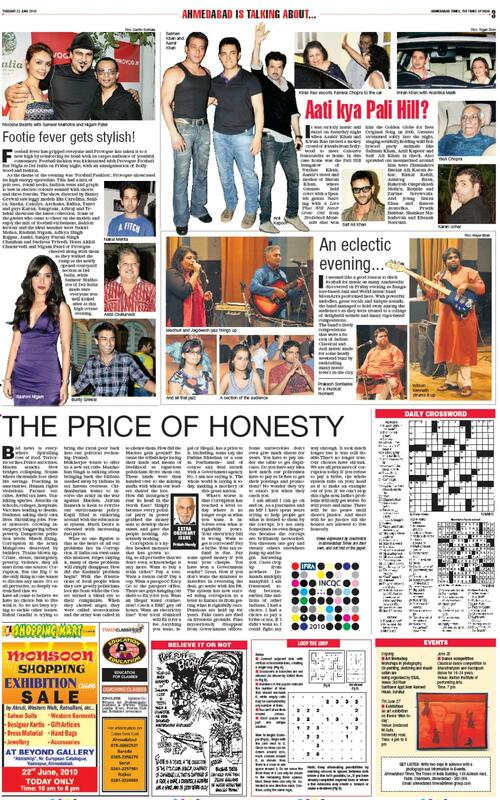 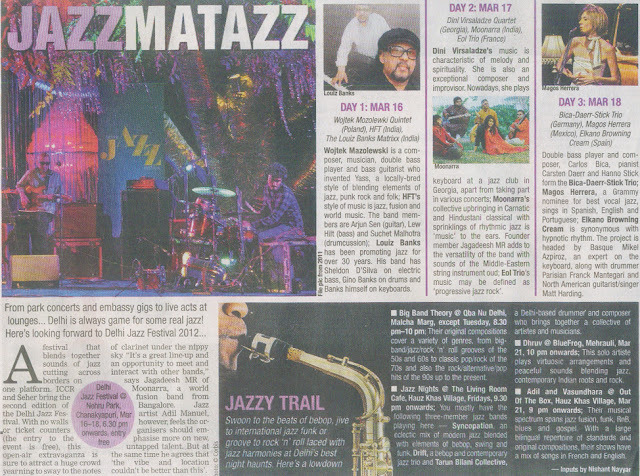 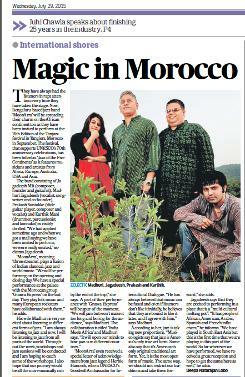 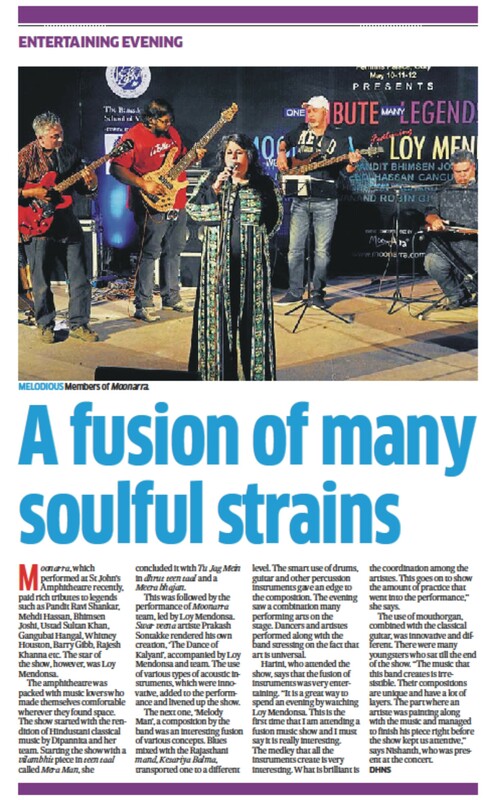 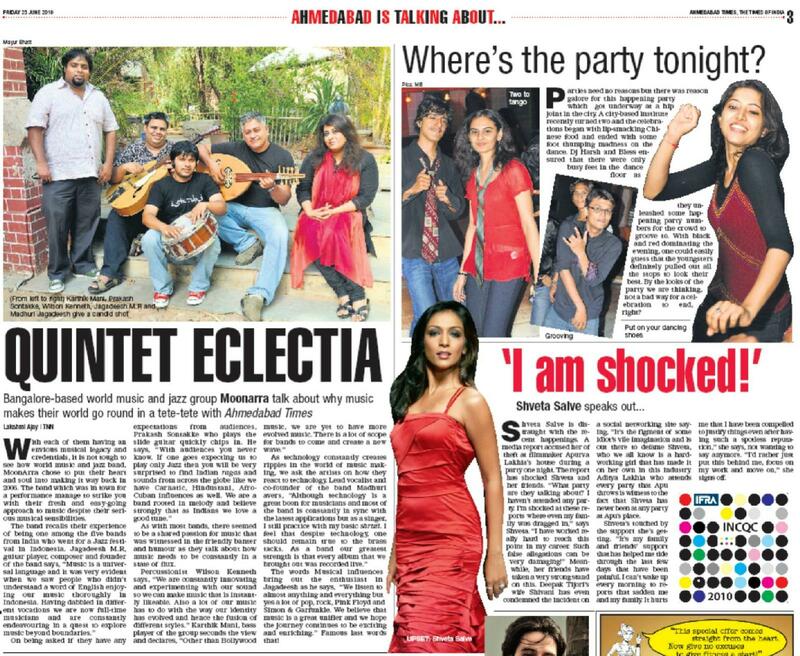 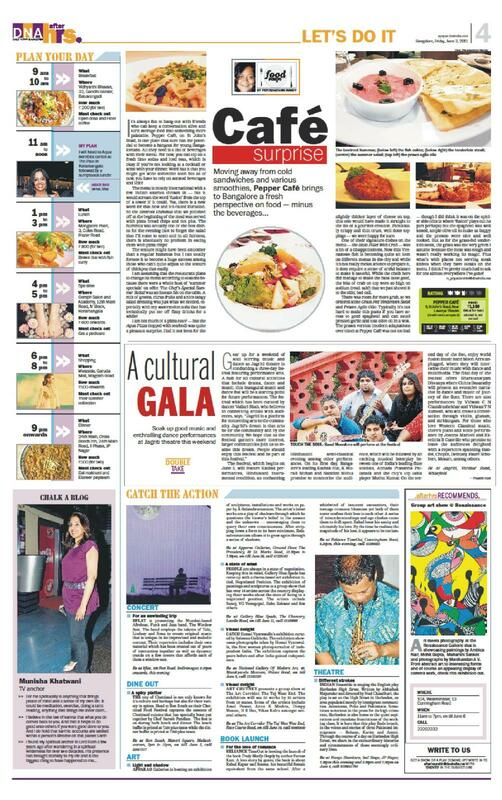 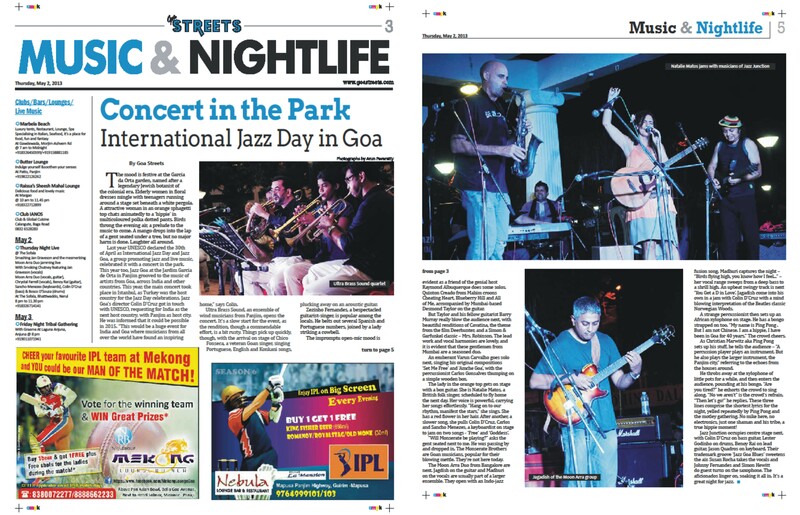 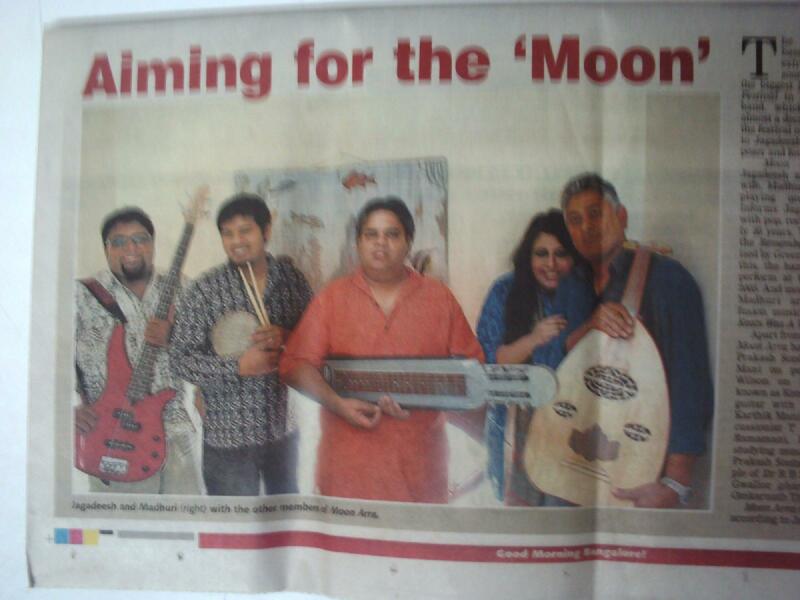 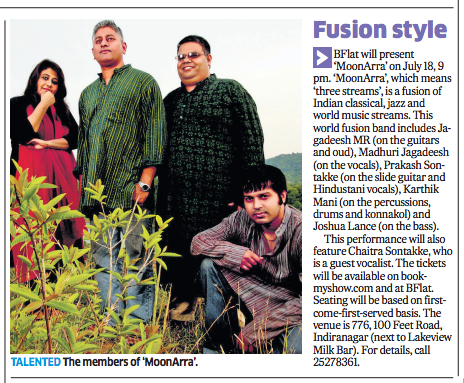 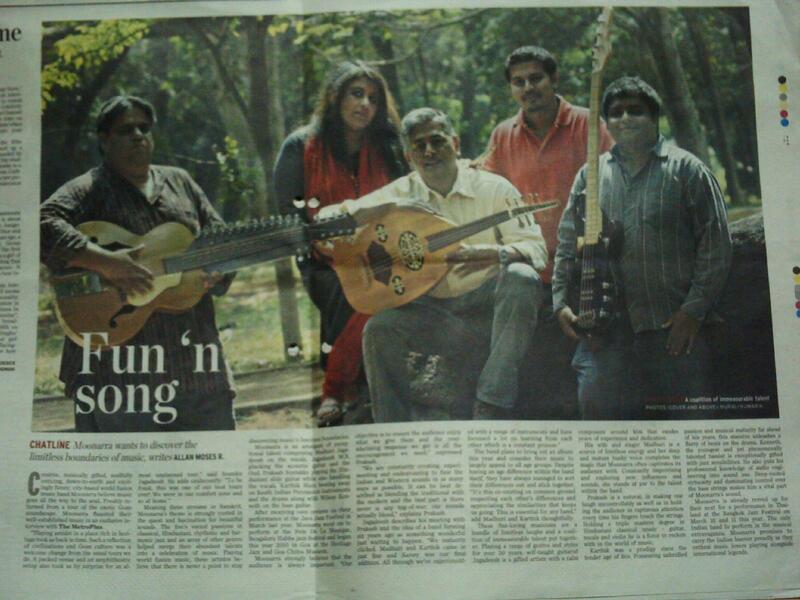 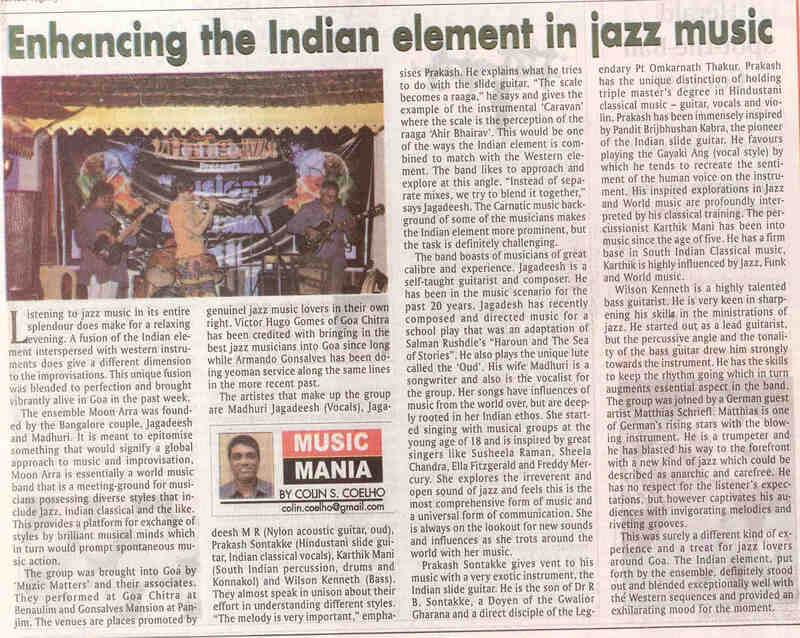 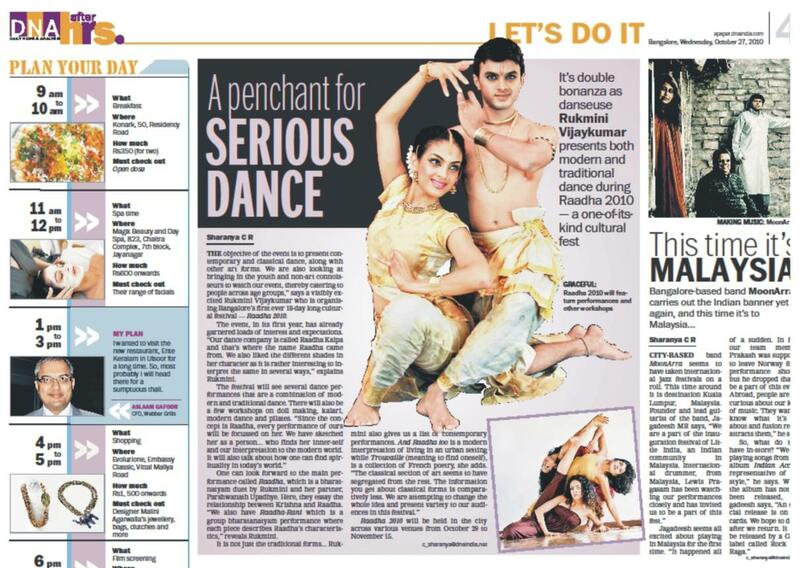 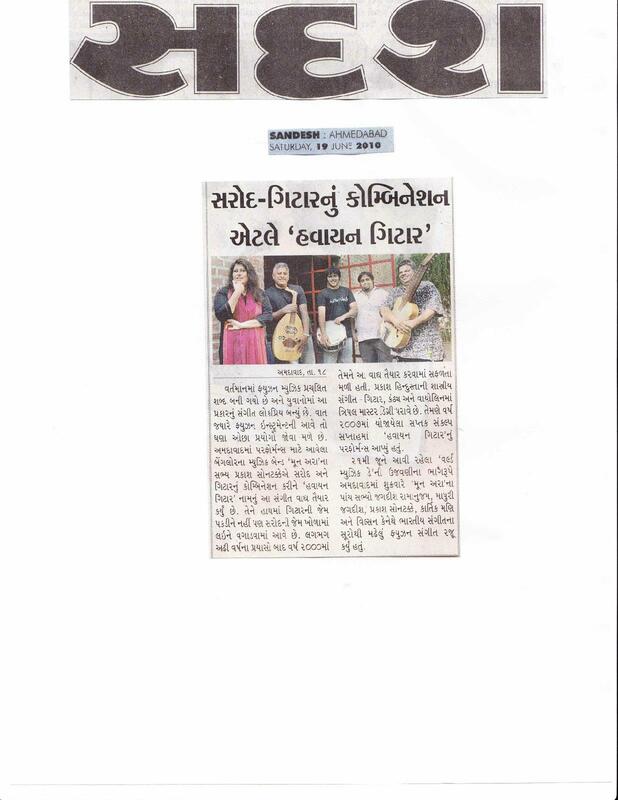 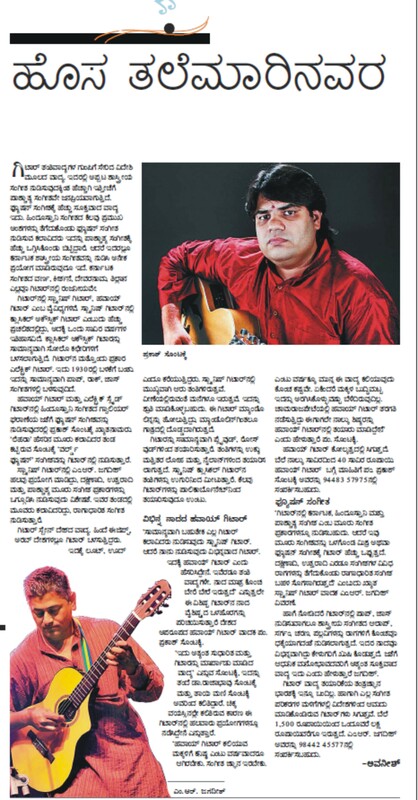 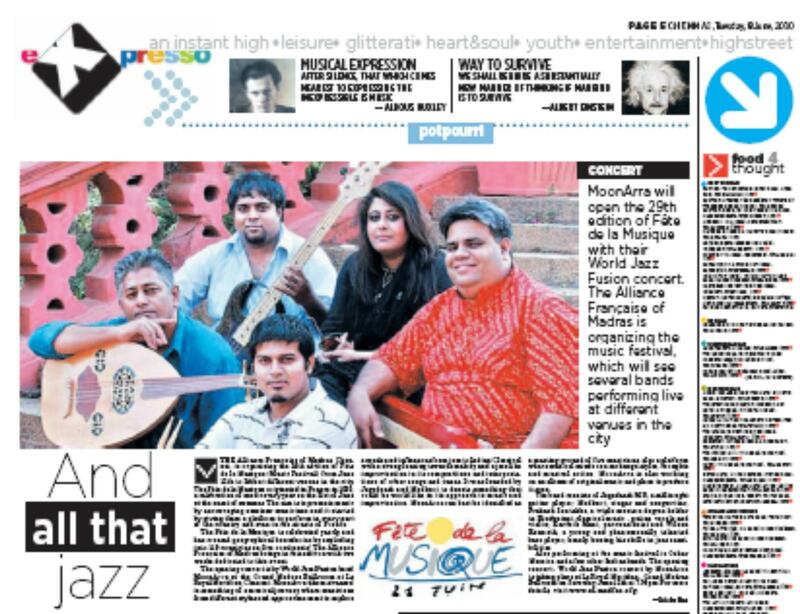 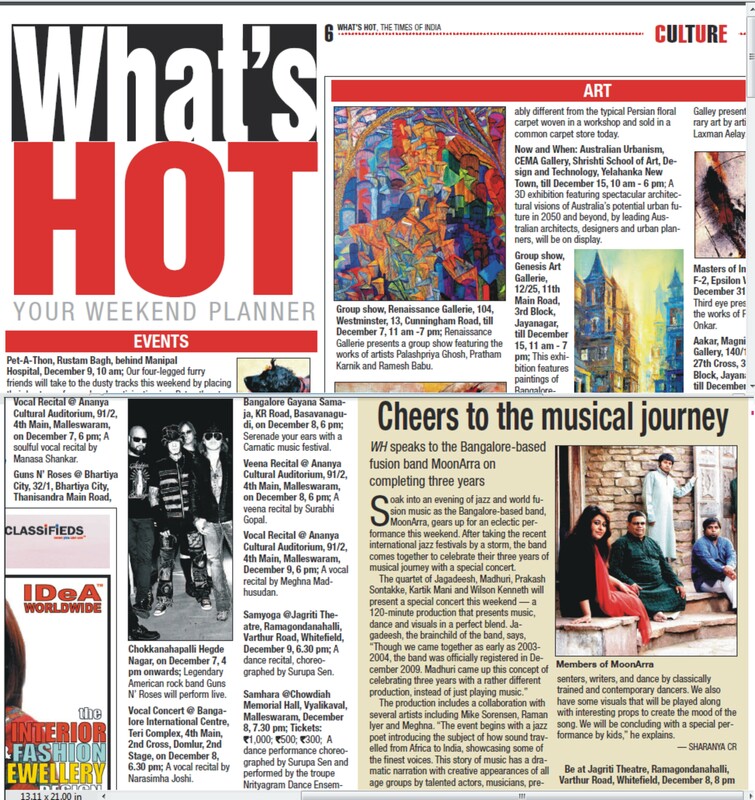 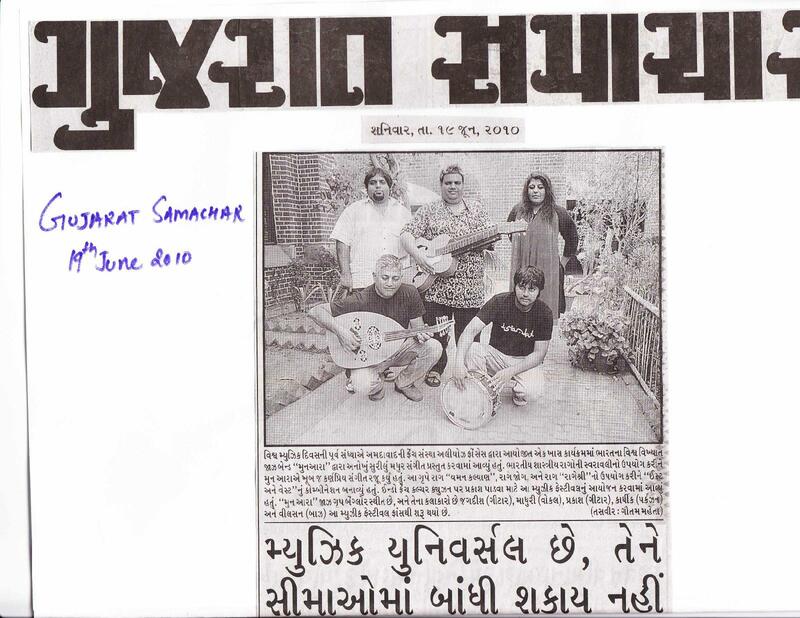 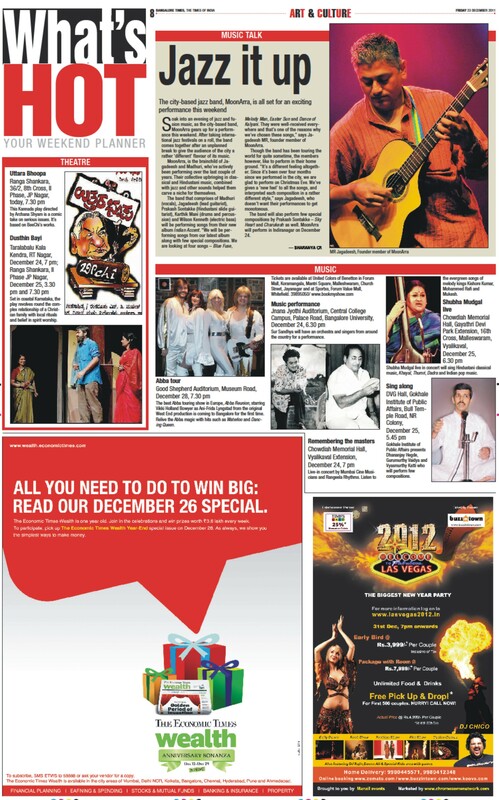 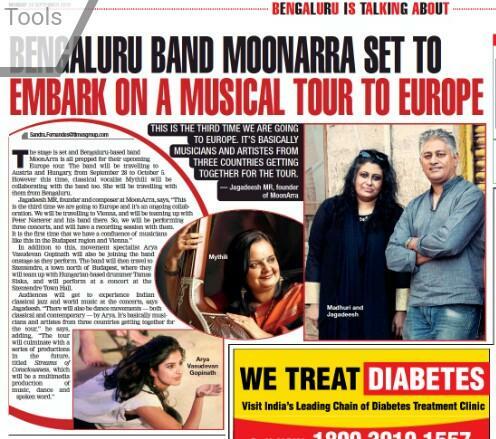 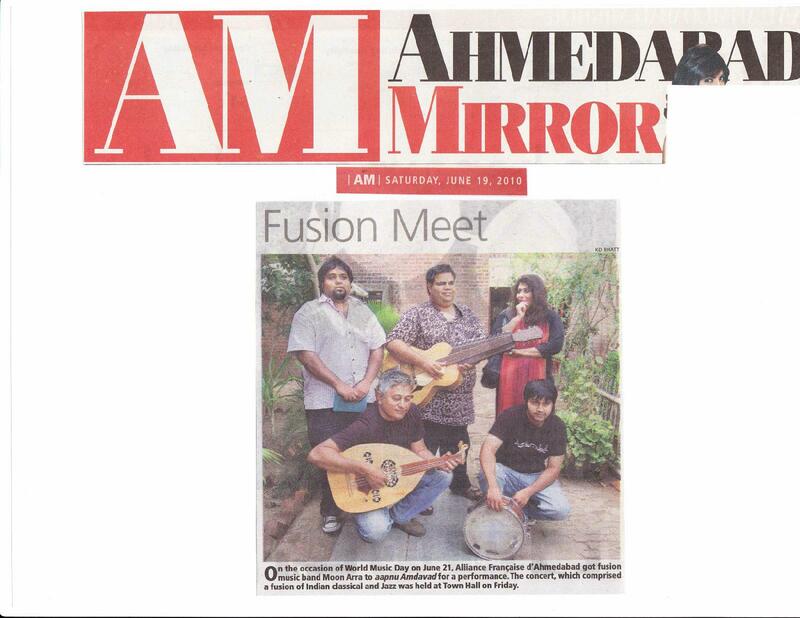 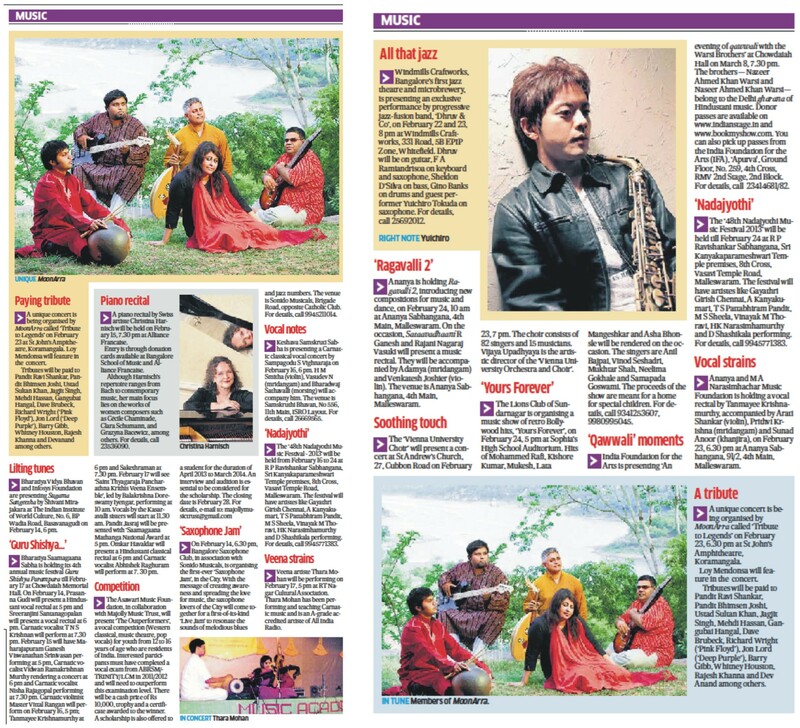 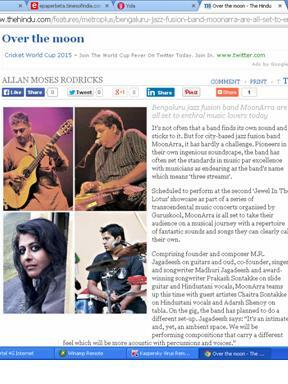 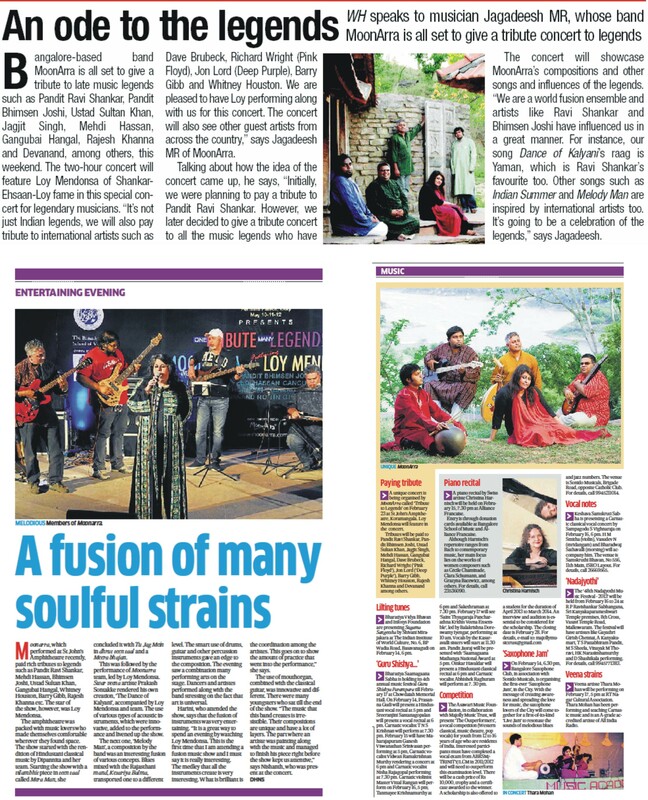 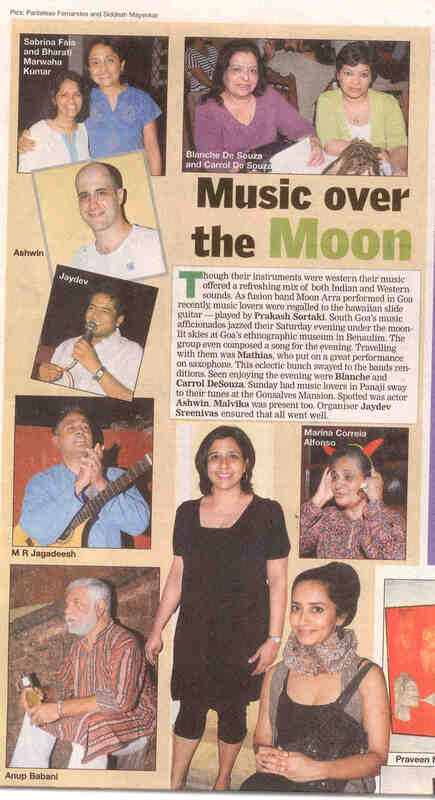 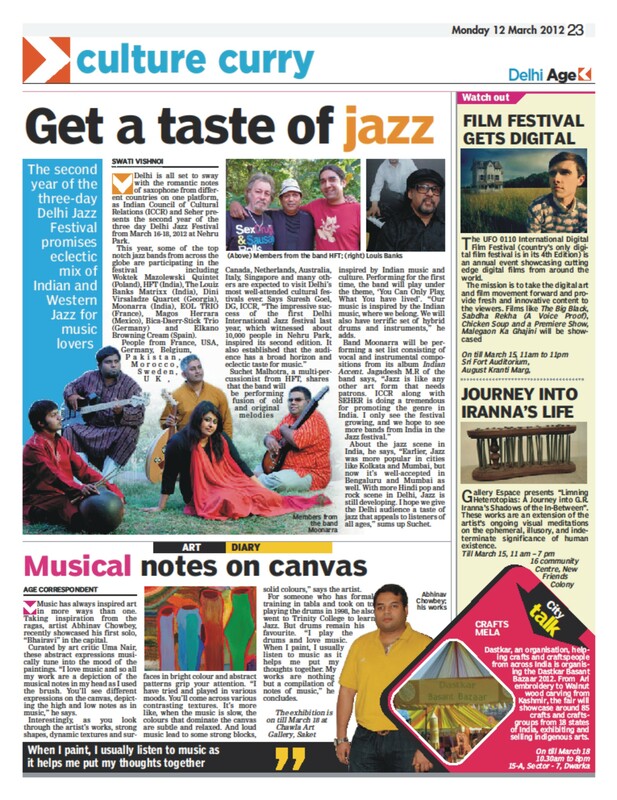 "Enhancing the Indian element in Jazz..."- Herald Mirror, Panjim, Goa, Jan 10 2010. 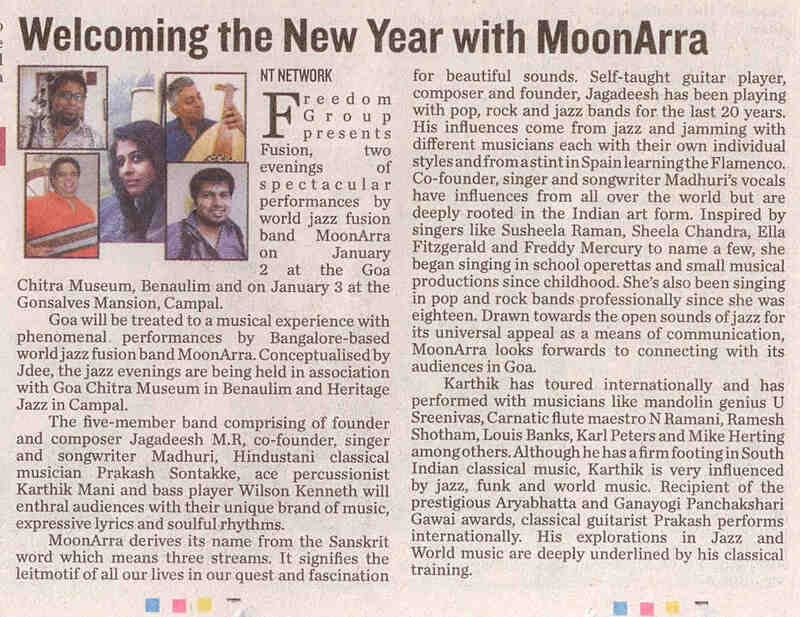 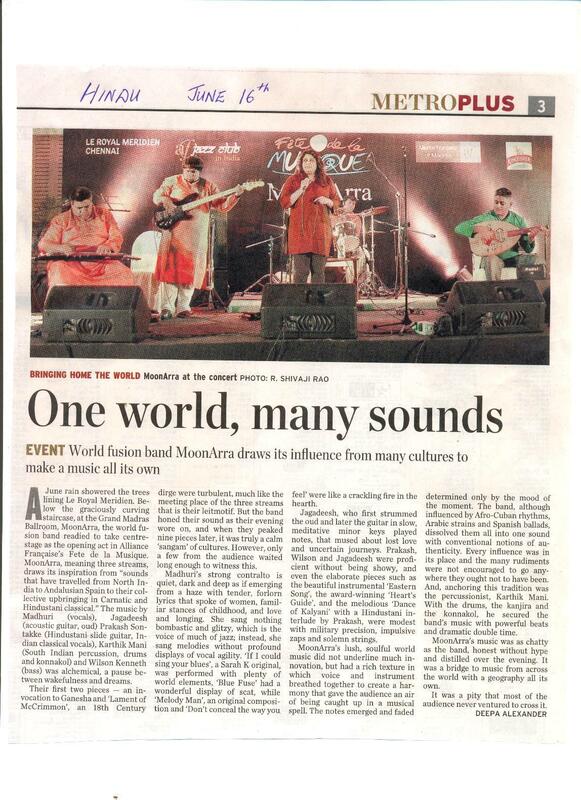 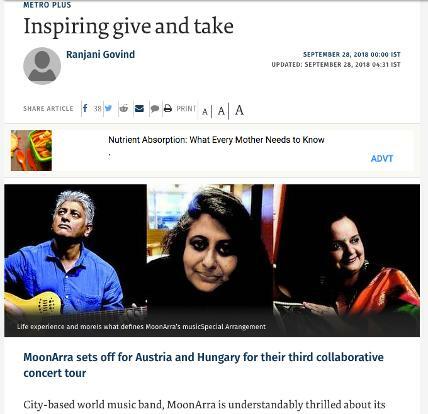 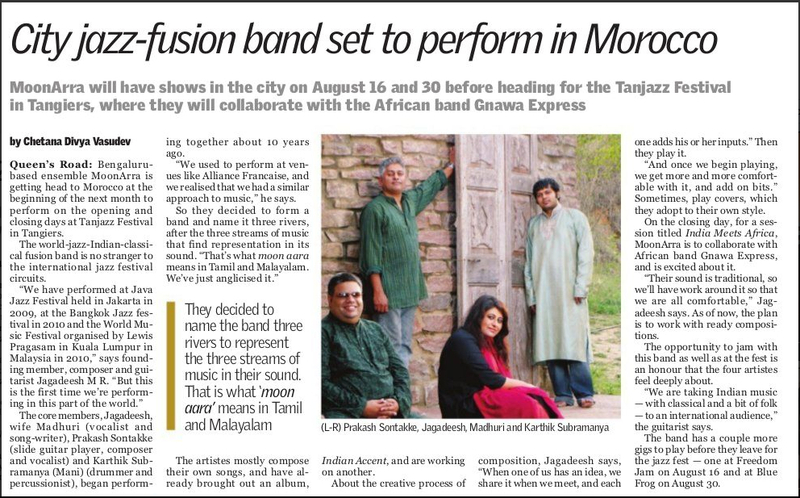 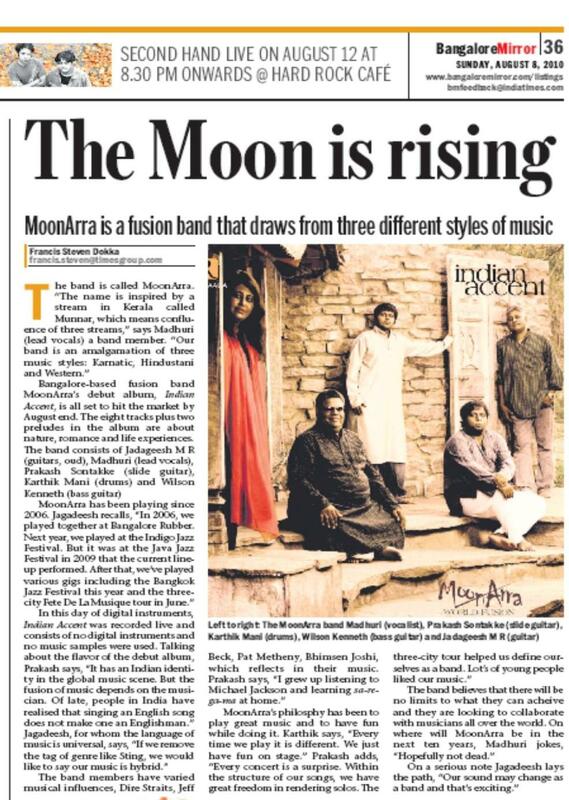 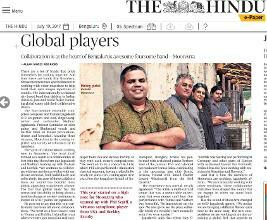 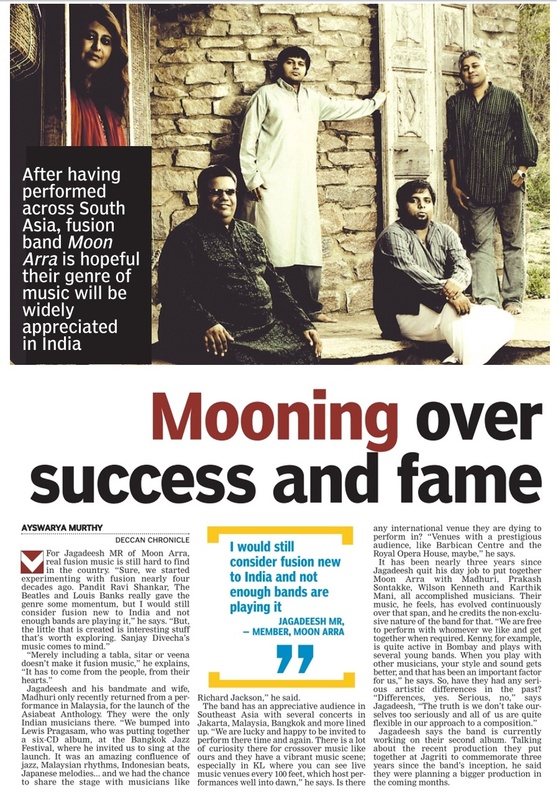 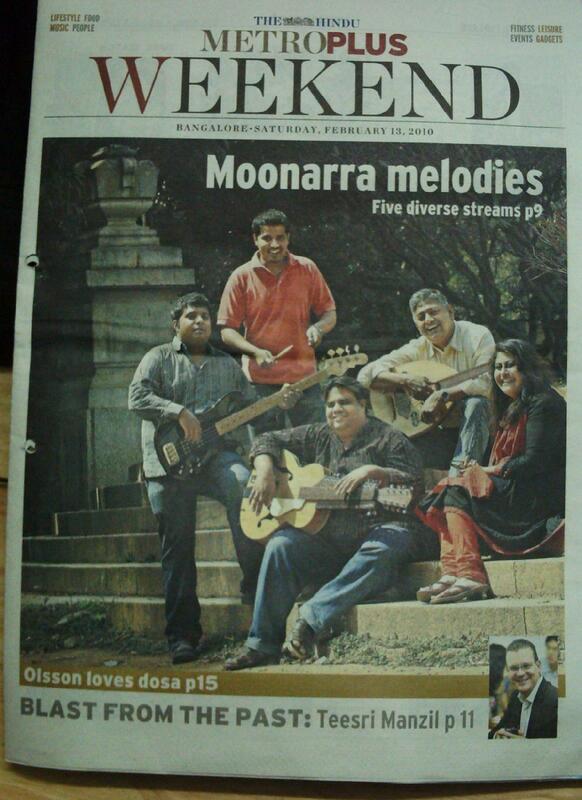 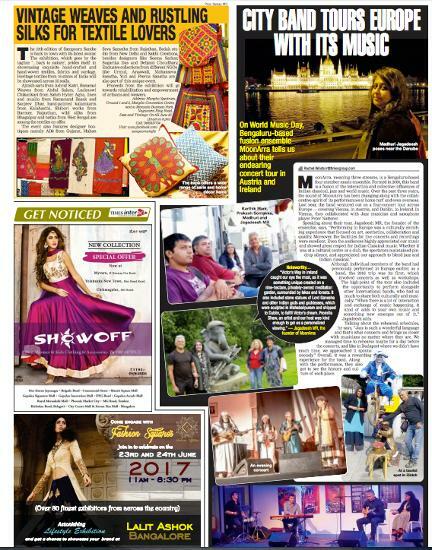 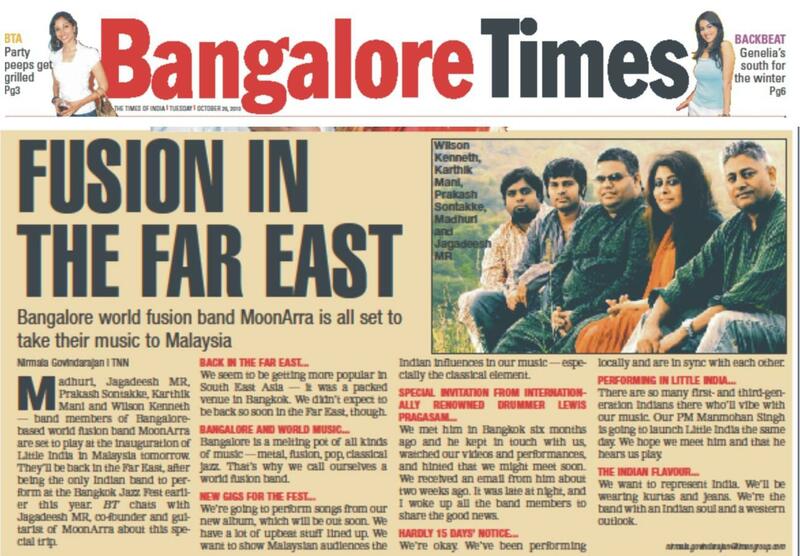 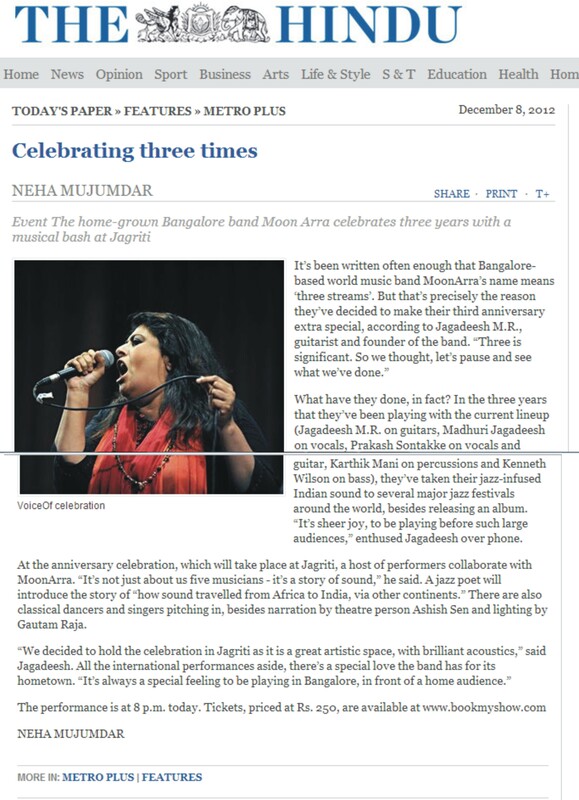 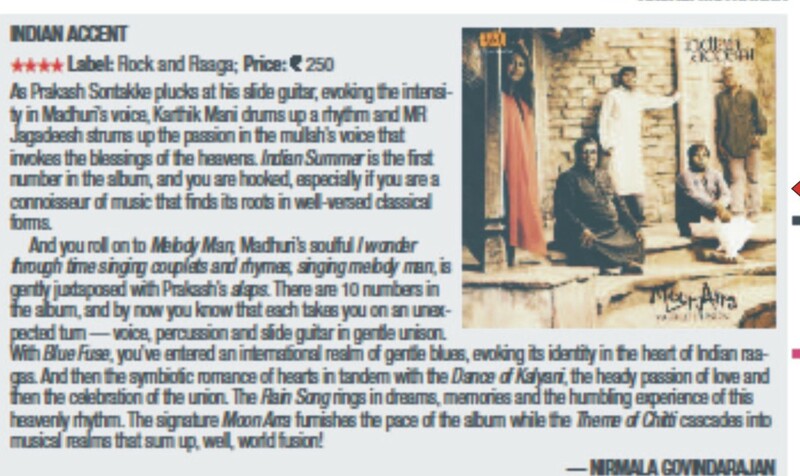 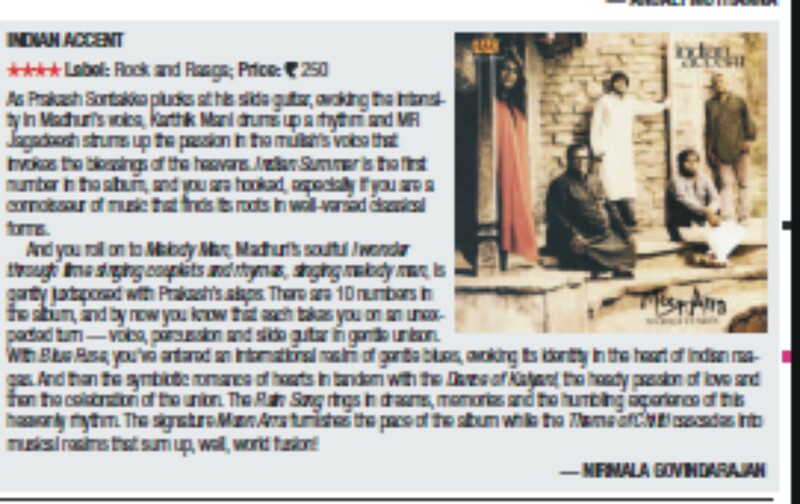 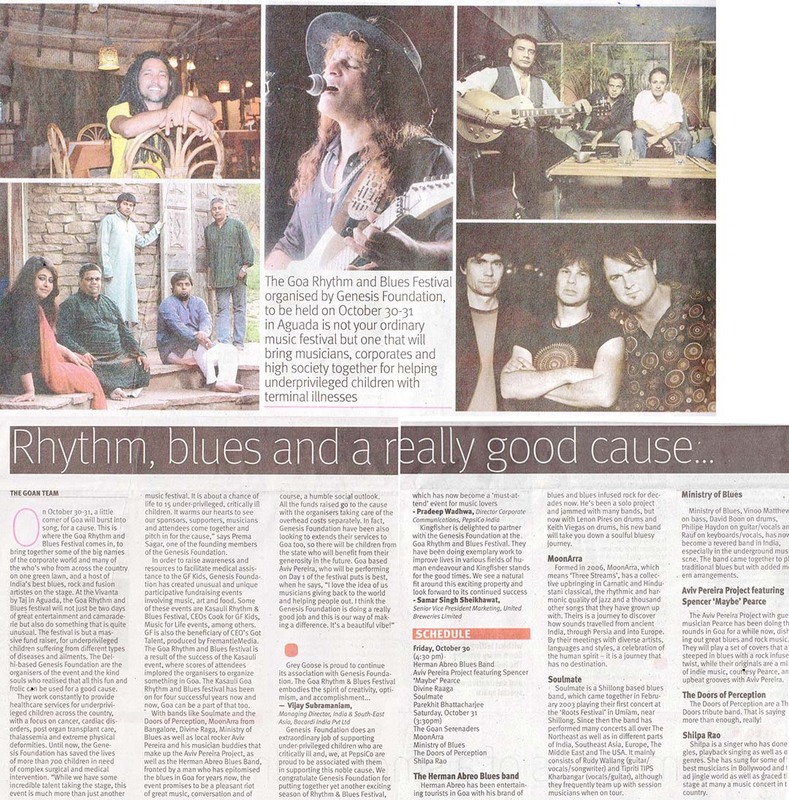 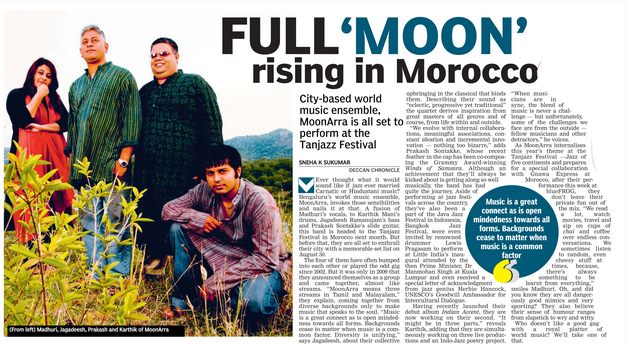 "Musically, MoonArra have successfully merged the free expression of jazz with Indian heritage..."The Herald, Goa, Jan 9 2010.